YSL bags do come in different sizes, ranging from very small, to huge. The YSL Sac De Jour Souple 36H Duffle Bag in Black Moroder Leather is one of the biggest of them. Simply said, this bag is huge and more than just practical. As we have mentioned, the first thing you are going to notice is the size. The bag is so practical that it can be used for any purpose you may have in mind. Furthermore, the bag is equipped with several additional elements which made it perfect for carrying large items or multiple belongings, all with the superb style and comfort. Inside you will notice a massive, main compartment which is suitable for anything you will want to carry inside. But, there are also a smaller compartment and a zipper-secured one, for smaller items. If this isn’t enough, there is an additional slot for bills and etc. Exterior is impressive as well. This duffle bag is made of black Moroder leather of the highest quality. The cracked design is impressive, looks modern and sophisticated at the same time. The calfskin leather is used for the entire bag and feet, which are also made of leather in this case. The most appealing element of the bag is the shoulder strap. It is made of leather and chain and it is actually one of the most desirable shoulder straps you will be able to see. It is also a standard model for this brand, so if you are looking for an extraordinary bag with the best shoulder strap, look no further. The YSL Sac De Jour Souple 36H Duffle Bag is suitable for a gym, for walking, for carrying different items, even laptops and all of that comes with a style. At the moment, there is no similar bag on the market, so we must say that this one is the ONE. One reason why we have so high opinion is the handles. They are tubular, so they are extremely easy to hold for hours. As such, if you need a practical bag, this one is once again a wise decision to make. 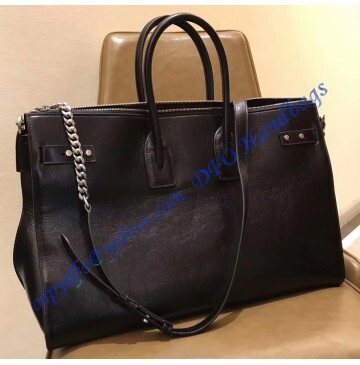 So, we saw that the YSL Sac De Jour Souple 36H Duffle Bag in Black Moroder Leather comes with a high quality, superb practicality and it even looks like no other bag on the market. This is the case only with rare models made by the fashion leader.